Increasing availability and processing power of devices, such as smartphones and tablets, opens up new media-rich possibilities for brands to engage with consumers. Beyond content marketing and two-dimensional interaction on websites and apps, Virtual Reality (VR) and Augmented Reality (AR) offer an opportunity to immerse the user directly in the simulated product or service experience. On the other hand, the data generated through consumer touch points creates possibilities for greater automation and development of smart, algorithmically-driven interactions. With customer experiences becoming increasingly multi-sensory and data-driven, marketing concepts may be insufficient to integrate all aspect that digital customer experiences can entail. 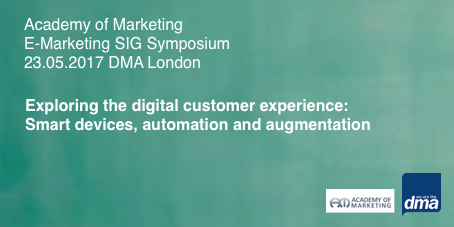 The purpose of the upcoming Symposium is to share and consolidate knowledge base on digital customer experience research in this fast-changing landscape, set the agenda for future research and crucially to support the development of ethically responsible and effective digital customer experiences. The afternoon workshop session will provide an opportunity to form research groups to develop future projects in the area of Customer Experience in 1. smart devices, 2.automation, 3. augmentation, with a view of making funding applications. The symposium follows from previous Academy of Marketing e-Marketing SIG workshops at Google London in 2014 and at Academy of Marketing Conference in Bournemouth 2015, in association with the Institute of Direct and Digital Marketing (IDM). The event is generously hosted by the Direct Marketing Association and linked to a future special issue of Journal of Research in Interactive Marketing. Salesforce Social Media Engagement in B2B and Positive Coping: Towards Gig Economy?